This class is a great opportunity for you to try something that you have always wanted to do, work with molten glass! 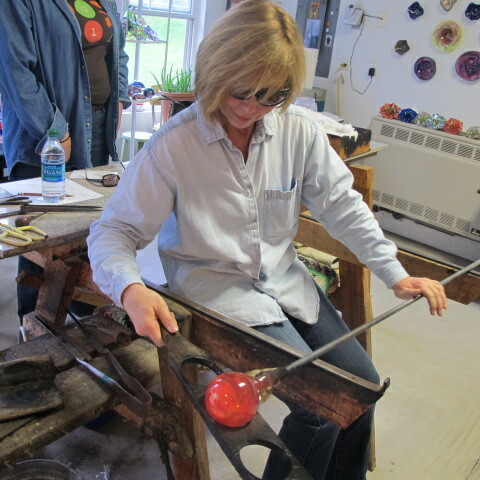 The class begins with a studio tour, safety information and demonstration of making a paperweight. You then will be coached step by step in making your own paperweight. Glass pieces created are then placed in an annealer overnight to cool down at a controlled rate and are ready for pick up the next day. All materials and tools are provided. A dress code of all cotton shirt and pants with long hair tied back is required. Bring a pair of sunglasses. Call the studio at 734-717-1136 to sign up for your class. I am currently not scheduling any classes at this time. Begin this hands-on class with a brief lesson on the science of glass, discover how glass is colored and what are the ingredients that make glass. Then we will have a paperweight demonstration. Each student will then be guided through the process to complete their own creation. Paperweights are then placed in an annealer to cool down overnight. Arrangements are made to schedule a pick up the next day. A dress code of all long sleeve cotton shirt and pants with long hair pulled back. Bring sunglasses if you have them for eye protection. The studio does have a supply of eyewear. ​All materials and tools are provided. ​Call the studio at 734-717-1136 to schedule your class. Lamp working Class - $50/hr. In this hands-on Lampworking class, students will learn the fine art of torch work. Exploring many techniques and design applications used for beads and sculptural pieces. Please call: 734-717-1136 to schedule your class. Limit 2 students for individual attention and instruction.